Economical circular totem This cardboard economical circular totem can be set up in a few minutes, and its lightness allows it to be very easily transported. Its printable structure on all its surface supplies a clashing visual impact.Delivered in its bag for a practical transport!Offered printing!Offered delivery! Cardboard communication triangle totem This triangle-shaped totem will come perfectly to furnish your exhibition or commercial stand by presenting your brand and/or your services ! Delivered in its bag for a practical transport!Offered printing!Offered delivery! Triangular discount totem This discout and triangular totem will be perfect for highlighting your brand image in any events in which you will participate: shows, exhibitions, point-of-sale advertising, etc.Delivered in its bag for a practical transport!Available in 3 or 4 modules!Free printing!Free delivery! 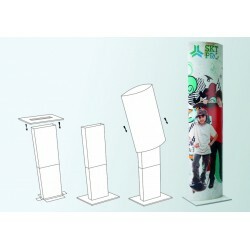 Double-sided convex totem This double-sided convex totem will allow you to highlight the key points of your activity. An adequate product to promote your structure in an exhibition or in your commercial premises.Delivered in its bag for a practical transport!Offered printing!Offered delivery! 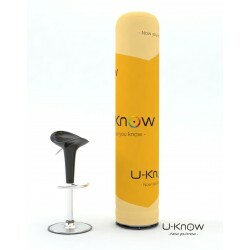 Tubular totem This tubular totem is light and easy to transport. 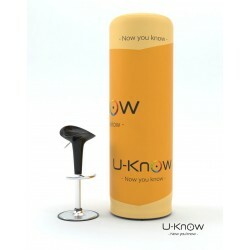 With its creative and modern design, it will be a great communication tool for your events. Delivered in its bag for a practical transport !Printing offered ! 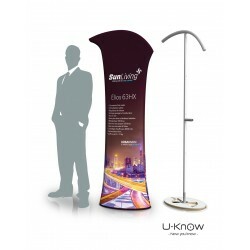 Stretch totem with aluminium structure Thise stretch totem with aluminium structure is super simple to install and easy to transport, it is a very efficient way to complete your stand. It will find its place in any kind event. Delivered in its transport bag! Custom printing offered ! Quick delivery ! 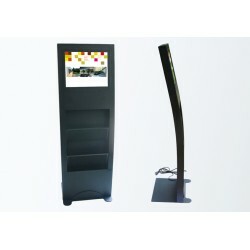 Multimedia Totem: This multimedia totem will allow you to put forwards the key points of your activity. With a screen and 2 document holders integrated, you will present your advertising supports efficiently. Sent in an armored box ! 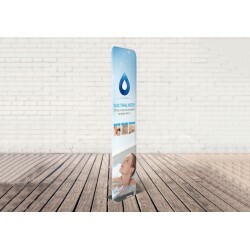 Triangular display totem This triangular display totem displays your message and enhance your image at your event or exhibition. Delivered in a handy carrying bag ! FREE PRINT ! 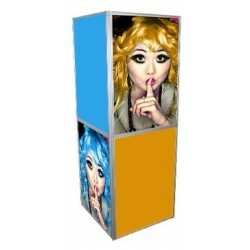 Square customable advertising totem This square advertising board will display your identity and your message on your stand. Delivered in a handy carrying bag ! FREE PRINT ! Stand Expooffers an equally effective alternative to roll-up : the totems. The principle remains the same, catch the eye of visitors to your stand. The differences? A better quality, more original designs and more robust without impacting the speed of assembly.